Have you ever wondered what an emergency flood services is and what benefits they have to offer. Imagine your home was severely damaged by flooding. This means most if not all of your belongings will be totally damaged. One of the benefits of opting for emergency flood services is that they help protect all the items in your home during the process of restoring the house. They will take all the necessary steps required to put your home back in order in no time at all while ensuring other areas of your home that looks intact are kept safe and secured. Emergency flood services are clean up and restorative services for homes affected by flooding. These services are provided by professionals who have the skills and experience to help put your business and property back in shape after the occurrence of disasters such as flooding, mold or even fire. Emergency flood service (EFS) experts are available for service anytime any day and are experienced in terms of working with insurance companies. A lot of the EFS providers offer transportation services of your belongings to temperature controlled storage facility to help restore your property while also working on the restoration of the affected areas in your home. There are some emergency restorative actions to take after a disaster has occurred. So long as the procedures are safe for you. These actions will help reduce the damage caused on your property while insuring your property and safety of your home as well. The first thing to do is to move everyone out including the pets to a dry, clean area. Food items that have been exposed to the flood should be disposed appropriately. Do not forget to do away with electrical appliances that have been exposed to water as well so avoid and desist from using it until they are checked. Wipe off water from all wood surfaces. If you are dealing with the water damage during summer months, you can turn on air conditioning but you have to be sure it’s safe for use. The air conditioning can assist in drying the water. If its winter, you can either decide to open the windows or switch on the air conditioning to heat the room. Disaster is extremely unpredictable and can struck at anytime when you least expected it. It can strike in different forms, shapes and style. So when disaster strikes, you need to get yourself fully prepared. When flooding disrupts your home, regardless of the amount of water, you need to consult the services of a professional emergency flood service providers to come to your aid. They are trained and skilful professionals who help you make the right move when needed. 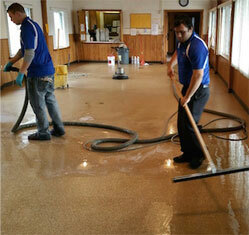 They not only perform water extraction after flooding but also help protect your property and home from future damage. With the help of a professional emergency flood service working for you, be rest assured that your property is in safe hands.